It's almost impossible to count all the theories about Area 51, but Cold War animosity is a pretty good one. Here's some quick background in case you haven't seen any popular science fiction in that last four decades. Something crashed near Roswell, New Mexico in 1947 and the US military brought whatever wreckage left to the secret research facility called Area 51. That event has spawned endless speculation that an alien spacecraft either crashed by accident or landed in New Mexico to make first contact, depending on the theory. 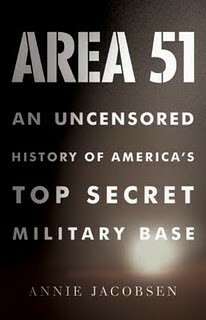 Now, however, a book called Area 51: An Uncensored History of America's Top Secret Military Base written by Annie Jacobsen posits that the whole kerfuffle in New Mexico was actually engineered by Soviet Russia to prove it could terrorize the American people. Jacobsen bases her book on the testimony of a single informant, an engineer brought in to investigate the remnants of the crash. He affirms that the Soviets launched a disk-shaped aircraft from a mothership located in Alaska to land in the continental United States. Because of the disk's shape, the craft evaded some radar detection, but was not completely invisible to 1947 instruments. The source said he saw Cyrrilic lettering on the ship as well as the bodies of several "child-size" pilots that were either genetically or surgically altered to have large heads and big eyes. These poor souls were apparently the result of experiments by the Nazi scientist Josef Mengele. The big question is "Why?" According to the source, the Soviets were afraid of the atomic bomb used to end World War 2, and Josef Stalin ordered the hoax in order to prove that he had the power to scare Americans just as much. U.S. officials covered up the hoax, because they were embarrassed that they were doing similar things with experiments on radiation poisoning. The guy's story is all very fishy, but Jacobsen believes that he is telling the truth. "He had nothing to gain and everything to lose by telling me, "but it was a matter of conscience for him," she said. I want to believe, as any fan of the X-Files will say, but I don't think I believe anything this guy is telling Jacobsen. There have been some far-fetched things that have occurred throughout human history, sure, but to assert that Russia orchestrated the whole Roswell fiasco just to strike fear into our hearts like some perverted version of the War of the Worlds broadcast just seems silly. Thankfully, both UFO supporters and military experts are coming out to denounce Jacobsen's book. "People have been studying the Roswell case for decades now," said Peter Davenport of the National UFO Reporting Center. "They've got deathbed testimony. They've got testimony from military officers who were involved, eyewitnesses. I think I'll go with the latter, rather than this young lady who penned this new book."